UPDATE: February 1, 2018 — Since this issue was first published, Chris Connor no longer has an association with Stumpy's and Jon and JoyAnn Charlton decided not to pursue a Stumpy's franchise. Jon Charlton might be a hatchet-throwing prodigy. On the helicopter pilot’s second-ever throw, the hatchet swings one perfect rotation, handle over blade and sinks into a target 12 feet away. On his third throw, he hits the bull’s-eye. Thunk! The sound is deeply satisfying. His wife, JoyAnn Charlton, is a different story. Her hatchets bounce off the target at unpredictable angles and clatter to the concrete floor. She gives up quickly. No matter. She and Jon didn’t really come to Stumpy’s Hatchet House to throw hatchets. They came here, to this otherwise sleepy industrial part of Eatontown, N.J., because they’re in the market for a turnkey business that will make them money while allowing them the free time they need to raise two kids. And they believe a hatchet-throwing franchise may be just the thing. This is an unusual referral. But Stumpy’s is an unusual business, to say the least. Its customers show up in groups -- birthday and bachelor parties are most common, but the business hosts company retreats, baby showers and even divorce parties. Each group rents a stall lined with steel fencing, and everybody takes turns hurling hatchets at targets. It’s not unlike darts, or even bowling, except that almost everybody who shows up is a virgin to the sport. Customers are welcome to bring their own food and beer -- nearly everybody drinks during play. Stumpy’s profits come primarily from renting out the pits and selling T-shirts in the lobby. The business began as a second-act career move for the two founding couples: Trish and Mark Oliphant, and Kelly and Stuart Josberger. Previously, Trish worked in merchandise sales for Ralph Lauren, and Mark was a union carpenter; Kelly had been an elementary school principal, and Stuart an IT administrator in the same school district. The two couples docked their boats -- named Nauty and Nice -- at the same yacht club. Through sailing and drinking, they forged a bond. One summer night in 2015, after a somewhat boozy grill session at the Josbergers’ house, Mark and Stuart started throwing a hatchet at a stump in the backyard. It looked like fun, so the ladies joined. Then the neighbors did, too. It was good, drunken high jinks, but nothing that seemed especially life changing. A month later, while drinking a cranberry beer at a local brewery, Trish turned to Mark. “We should open a microbrewery,” she said. Mark laughed. “I only know how to drink beer,” he said. Bull’s-eye. Mark and Trish scribbled a rudimentary business plan on a cocktail napkin and ran it straight to the Josbergers’ house. “What do yous think?” asked Trish, in her thick Jersey accent. They thought it sounded great. Things moved quickly after that. The founding four named the new company after their first target: the stump in the Josbergers’ backyard. They decided they’d keep the rent low by finding an industrial warehouse space off the beaten path -- a challenge that proved tricky. The partners looked at eight locations before finding a properly zoned, 4,880-square-foot former boxing studio with a landlord who was amenable to an unholy marriage of booze and flying weapons. They talked to him for two hours before he was convinced that the idea was legit and, more important, that it was less dangerous than boxing. Then came the hatchets. They tested about 12 before finding one they loved. Trish used her marketing experience to design apparel, while Mark loaded the bed of his F-150 with lumber and set to building an environment that captured the essence of a tree-lined backyard. He hung New Jersey cedar on the walls and replaced door handles with old axes. He erected throwing pits and fashioned a raw-edge cherry countertop in the lobby. In the meantime, Kelly and Trish pitched the idea to servers and bartenders just to gauge their reactions. “Picture this: a place where you can go and throw hatchets,” they’d say. People loved it. In April 2016, Stumpy’s Hatchet House opened. Six months after that, it was hosting 400 to 500 customers a week. Another year later, here they are, courting franchise partners. Which is an uncommonly bold strategy for any startup, much less one that started off as a bit of a lark. But they’re committed. “We think this is going to be the next wave in indoor recreation,” says Trish. That might well be true. But like any franchisor with a buzzy idea, they’re going to have to move fast. Because no matter the concept, competition is never far behind. After Jon and JoyAnn’s private facility tour, they settle around a 12-foot-long table that Mark built to fit the conference room. Out in the pits, the din of success and failure grows louder. For every hatchet that sinks into wood, another crashes to the ground. There are battle cries and taunts, applause and frustrated expletives. A phone call to Trish established her sanity, and Conner booked a flight to New Jersey. He drove out to Eatontown hoping to see two things: profits and replicability. On profits, Stumpy’s was gold. The company was all but printing cash. Each of the eight hatchet-throwing pits accommodates up to 10 customers. The fee to throw is $20 per hour, and most people book two. After factoring in $20 T-shirts and $3 beer coozies, Stumpy’s reports an average spend of $61.64 from its customers. And with no food or expensive merchandise, the company’s overhead is remarkably low. In August, after 16 months in business, it hit $1 million in gross sales. Conner liked what he saw, and the Stumpy’s founders liked him. They began a four-month process of preparing to sell the first franchise. Under Conner’s guidance, Stumpy’s filed all the necessary paperwork and developed business plans, marketing material and training manuals that could be passed on to new buyers. The original website, designed by Kelly, was replaced with a polished professional site that directs budding hatchet enthusiasts to their nearest location. To make it as a franchise, the system would need to be faster, easier, and scalable. Stumpy’s needed targets that anyone could swap out, first day on the job. “But where do you manufacture the boards?” JoyAnn asks. “We bought a warehouse,” says Mark. They’re not free, of course. The boards will cost each franchisee $5.25 each, plus shipping. But what Stumpy’s is selling here is logistical ease. They’ve simplified the challenges of running the business. What started as a cocktail-napkin idea is starting to look like a scalable turnkey operation -- as long as these early partnerships pay off. For his part, Conner is betting on explosive growth in the coming months. He says a typical franchisor, assuming it starts with a healthy profit strategy and a replicable model, will likely sell somewhere between two and six franchises in its first year. Stumpy’s has already sold three -- one in New Jersey and two in Texas. At the rate it’s going, Conner estimates that it will sell a dozen. Discovery day’s main event is a PowerPoint presentation that outlines the details of finding real estate, training a staff and preparing to open a new hatchet house. The emphasis is on ease of operation. Stumpy’s corporate will supply the targets, signage, administrative tools like software-loaded tablets and hatchets, which the company buys in bulk at a discount from Home Depot. (It’s still working on a deal with Estwing, the hatchet manufacturer.) Mark will build the custom decor, and Trish is designing a look book to provide a selection of couches, rugs and artwork. It’s the day’s only hint at what the founders know but can’t share: that they’ve filmed an episode of Shark Tank. It’s clear that the national attention will give the brand a boost, but until the episode is public, the Josbergers and Oliphants are bound to silence about it. 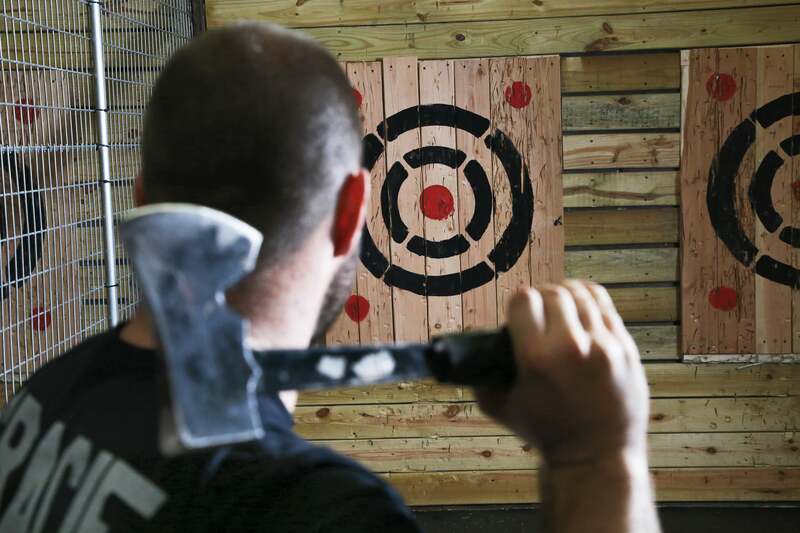 In the 18 months since Stumpy’s opened, hatchet-­throwing facilities have begun cropping up all over the United States. Some of them focus on league play, others on parties. At least one company, Axe Monkeys, in Las Vegas, which takes a family approach by permitting children and forbidding booze, is also trying to franchise. Jon and JoyAnn agree, but three weeks after their discovery day, they’re still weighing the numbers. It’s understandable: In addition to the $30,000 franchise fee, they’d need roughly $350,000 for the build-out, hatchets and targets, marketing and other expenses leading up to opening day, and for the first six months of operation. They’re looking into small-business loans and, since Jon was a military pilot, veteran programs. They’re also waiting on quotes from insurers and researching their local rental market. What’s more, the first three franchises have yet to secure locations. Two of them spent more than three months searching. Zoning is proving to be a sticking point. 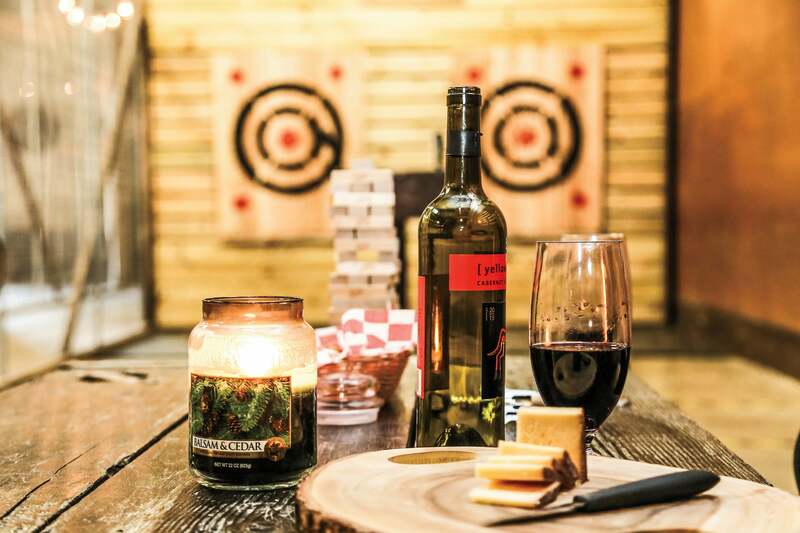 Local districts don’t have clear spots for BYOB hatchet houses, so early buyers are finding that they have to appeal to zoning commissioners, which takes time, in an arena where time is of the essence.